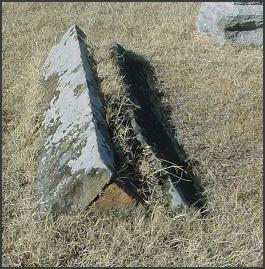 The tent grave, or triangular slab grave, is constructed with two flat, rectangular slabs of rock propped against each other to form the sides. A flat, triangular piece of stone forms each end. 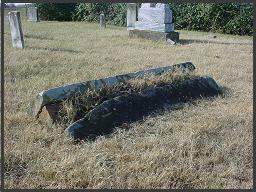 There are two examples of Tent Graves in Benten County. Both are made of shaped native stone. The Leetown grave is the nicest example, and is inscribed on the triangular endpiece. 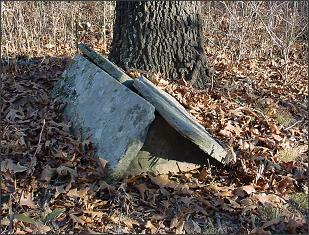 The Buttram's Chapel grave is low to the ground, and appears to be unmarked. Tent graves may also be made of concrete. Names and dates for persons buried in tent graves may be found on a separate headstone, carved into one end, or carved into the side. As with box tombs, this type of monument does not represent above ground burial.